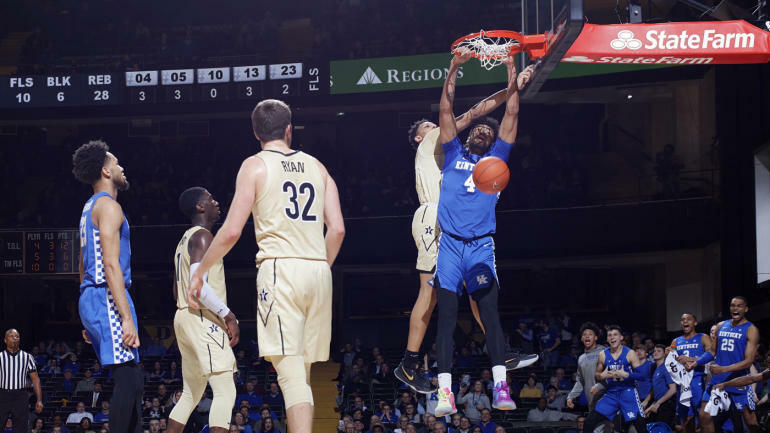 Kentucky basketball’s winning ways that peaked Saturday with a convincing win over Kansas continued into Tuesday with its third-most lopsided win of the season over Vanderbilt. At Vanderbilt. The No. 7 Wildcats improved to 17-3 on the year and 6-1 in the SEC by pounding the Commodores into submission 87-52 to extend their winning streak to seven, matching their longest winning streak of the season. John Calipari’s team led by as many as 37 points in the second half, and as you can gather by now, this one was over in a hurry. Ten minutes in, it was Cats by eight. Twenty minutes in, it was Cats by 30. Everything worked for Kentucky against Vandy, and the opposite was true of the home team. UK got 26 points on 9-of-15 shooting from PJ Washington, 12 points on 6-of-13 shooting from Tyler Herro, 11 points on 3-of-6 shooting from Keldon Johnson, and gave up just seven turnovers. The Commodores, however, couldn’t buy a bucket or ball security. They turned it over 20 times, shot just 17-of-46 from the floor, and mustered their lowest scoring output at home since March … in 2014. That instance also resulted in a loss, as LSU handed Vandy a 57-51 defeat in Nashville under then-coach Kevin Stallings. And thus continues Vanderbilt’s downward slide in the SEC. At 0-7 in league play, it is the only winless team within the conference. It’s also a microcosm of its season to this point, because Bryce Drew can’t win for losing. This season was supposed to be a big one, with Simi Shittu and Darius Garland paving the way for an NCAA Tournament berth. But Garland got hurt early and is done for the season, Shittu isn’t built to carry the load, and the team is stuck in sand going nowhere fast. Now 9-11 on the season, Vanderbilt went winless (0-8) in the month of January, and is in danger of not reaching a doubledigit win total for the first time since the late 1940s.